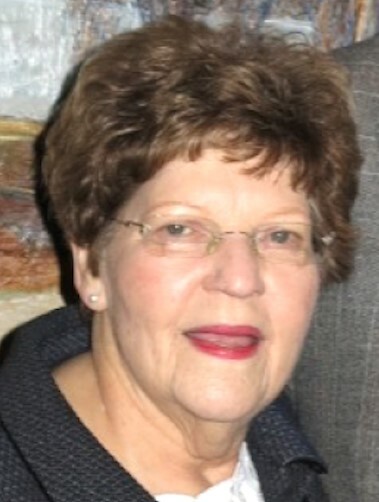 Judith “Judy” Margulis, 84 – Herman Meyer and Son, Inc.
Judith Margulis, nee Hershenow, of Louisville, Kentucky, passed away on Saturday, January 26, 2019. 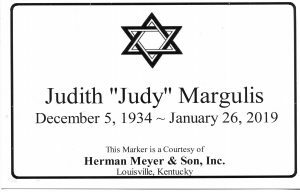 Judy was born on December 5, 1934 and raised in South Bend, Indiana, the daughter of the late Solomon and Blanche Hershenow. She attended Central High School and graduated from Indiana University while working full time to achieve her diploma. She was a loving wife, mother, and grandmother and is survived by her husband of 62 years, Martin; daughter, Cari Margulis Immerman of Shaker Heights, Ohio; son, Paul (Herlene) of Louisville; and grandchildren, Nathan and Noa Immerman and Bradley and Matthew Margulis. She was predeceased by her sister Lois. Her enjoyments were many. She was an avid reader and crossword puzzle expert. With her dear friends, she enjoyed Mah Jong, Bridge, baking days, and two stock market clubs. She was also active with Adath Jeshurun Sisterhood, B’nai Brith Dolls for Democracy, National Council of Jewish Women, and Hadassah. The family would like to thank all who helped care for Judy during her illness, including Drs. Harry Renco and Jane Cornett, and the staff of the Episcopal Home. For the past three plus years, the caregivers from Jewish Family and Career Services have been exceptional, including Rhonda, MaryAnn, Marion, and Sarah, and have become part of our family. Funeral services will be held at 2:30 p.m. on Monday, January 28, 2019 at Herman Meyer and Sons, Inc., 1338 Ellison Ave. Louisville, Ky. 40204. Visitors welcome after 1:00 p.m. Burial in Adath Jeshurun Cemetery. Friends who wish may express their sympathies by donating to Congregation Adath Jeshurun, Jewish Family and Career Services (JFCS), the Alzheimer’s Association, United Hatzalah of Israel, or a charity of your choice.